Acctivate supports the importing in of an Authorize.net credit card authorization along with a webstore order, using our Webstore module. Once you are ready to invoice the sales order you imported in from your webstore, Acctivate will utilize the Authorize.Net Transaction ID to complete the credit card transaction. 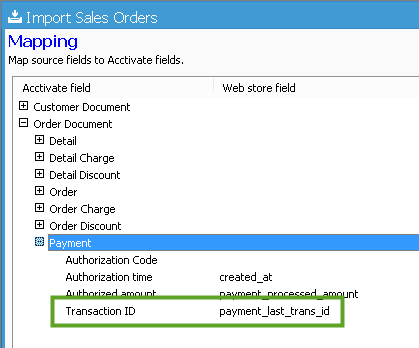 In order to configure Acctivate to complete a credit card transaction in which the credit card has already been authorized on the webstore, you will need to modify the webstore mapping to import in the Authorize.Net Transaction ID with the order. You will need to configure Acctivate to integrate with Authorize.Net so Acctivate can then validate the Transaction ID at the time of Invoicing in Acctivate.